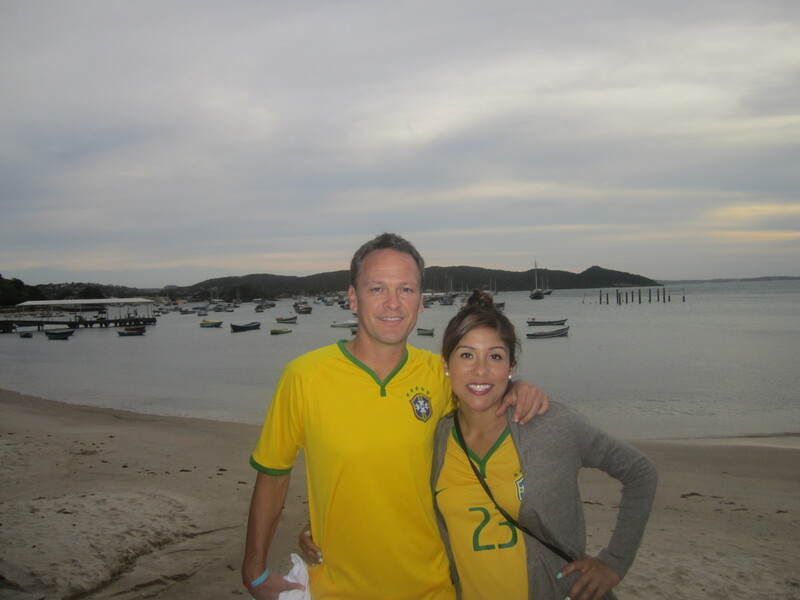 It was time for our side-trip to the “St Tropez of Brazil” called Buzios. This resort town is about 3 hours away and we had secured a nice 20+ passenger bus to take us. It was a bit of a slow start as we were to be picked up at 10am per Pedro…but house owner Alex said he thought he heard him say 11…and after an hour of waiting it showed up and we hit the road. All were a bit tired but Duncan, aka DJ Bummers as he had been coined by the 20-somethings in the group for his less than stellar song choices, got his music going and about halfway in some of the beers started flowing and we were ready to get there. Our house again was excellent with plenty of room for our 19 people, a pool (which no one went in), big yard and a nice little view of the ocean from our hillside vantage point. Cida the owner met us and got us settled and then we all headed into town on the short 10-minute walk down the hill to the main street on the water. Its a gorgeous town that has the feel of an island as its actually a small peninsula with juts and fingers of land and water forming multiple beaches amongst hills and amazing homes and boutique hotels. The main street is heavily cobbled making it hard to walk on even without any influence and is awash with shops, restaurants and bars. 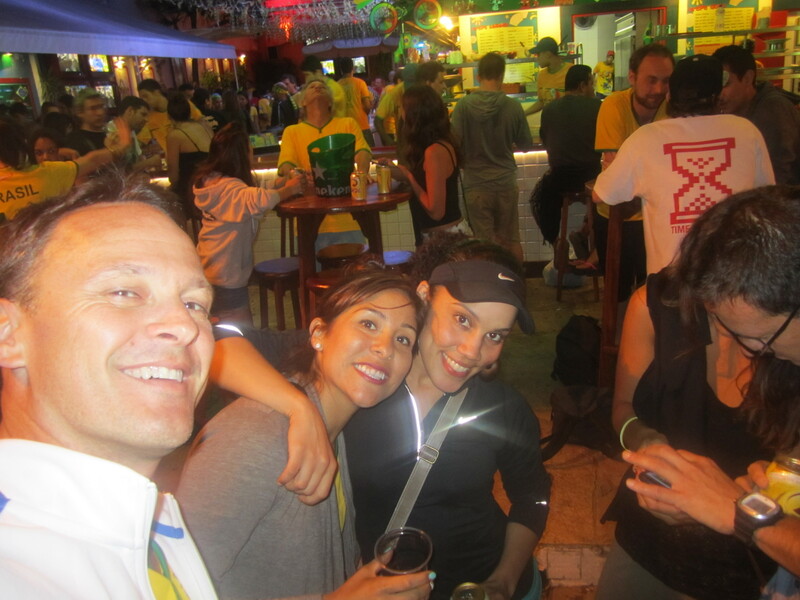 The last Brazil group game was about to start so we found a good restaurant where we could all sit outside and watch. 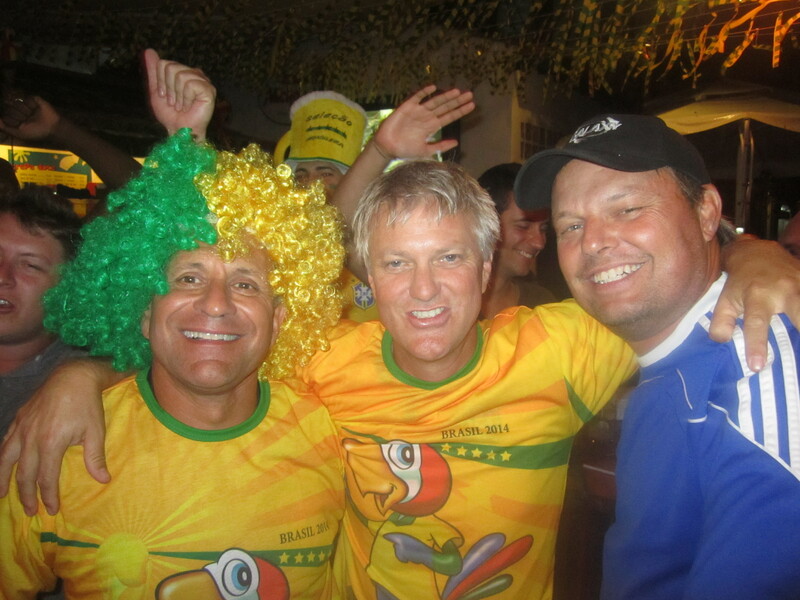 The whole town erupted with each of the 4 Brazil goals scored including some fireworks. The day marked the unofficial/official 4-year anniversary of Joe-Anna and I dating plus the night became Brian Mackerer’s unofficial bachelor party so plenty of shots showed up, more drinks and more chanting. All of a sudden Brian appeared in some brand new Brazilian super short tights which caused an uproar of laughter and pictures of course. We ended up at the hot spot right in the middle of town which was a cool crepe restaurant called Chez Michou. Typical open place with tables right on the sidewalk and people spilling into the walk-street. 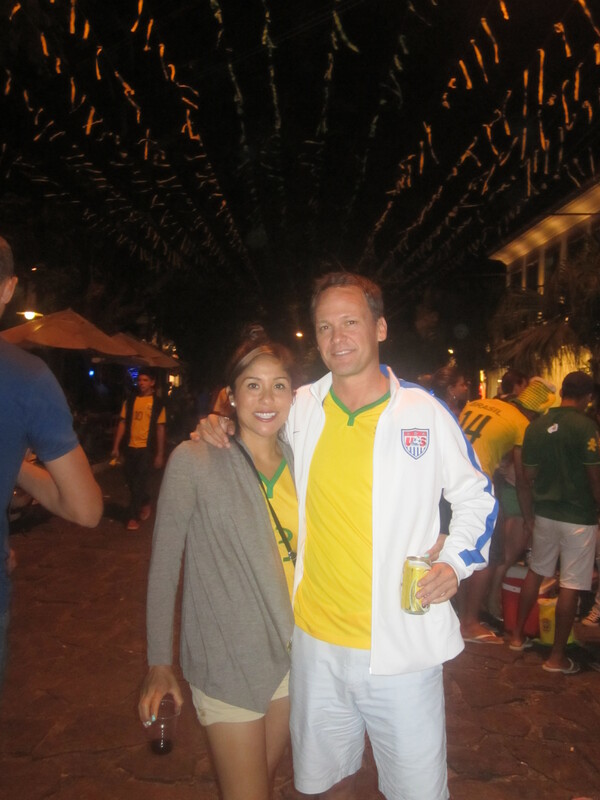 Even though its their off-season the town was jumping since Brazil played and won and it turned into an awesome night meeting people from Brazil, Ecuador, France (uh, Duncan) and the US. 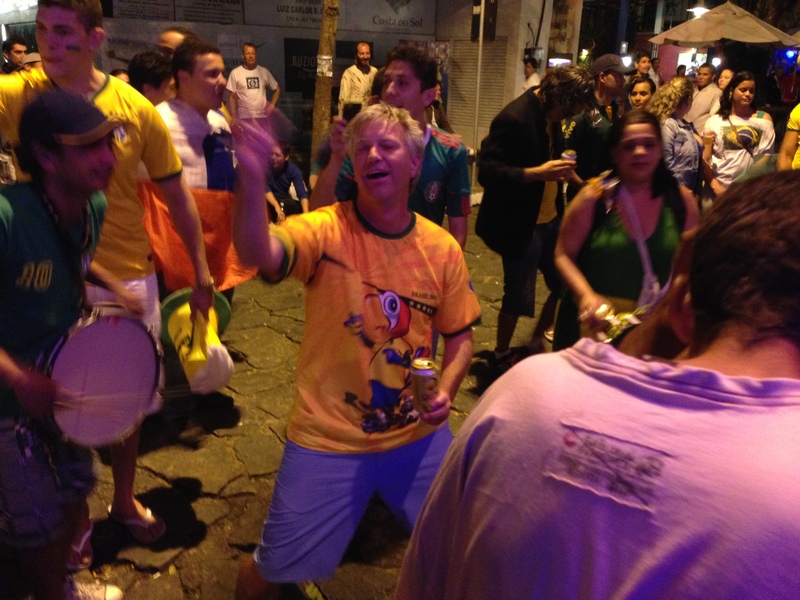 At one point a band rolled up playing cool Brazilian tunes which got everyone dancing in the street. 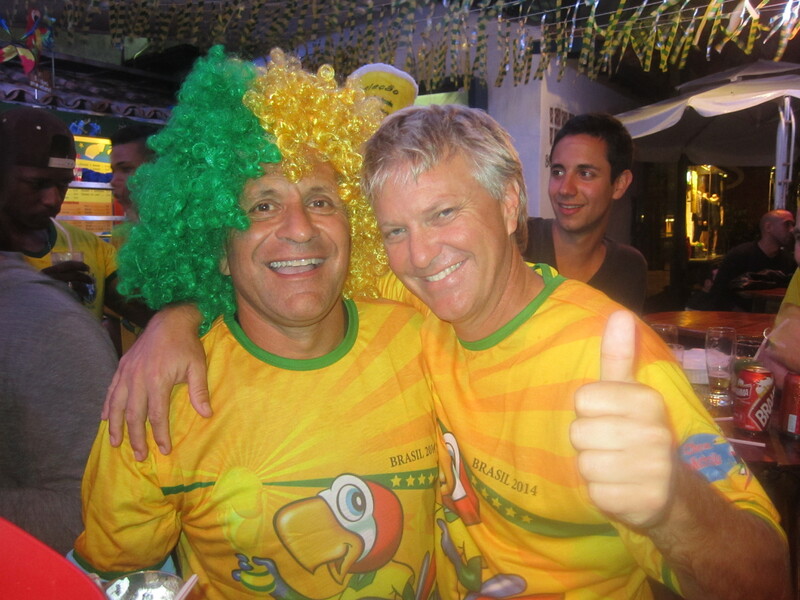 Mackerer decided to grab the parrot head off the restaurant mascot and put it on and walk over to our table…hilarious for us, not so much for the restaurant manager. And then Mackerer’s dream scenario as a capoera troupe appeared to put on a show…cue Mackerer dropping down to just his new white tights to engage them. They werent ready for him and shooed him out of the way so he stretched out on the side as they put on their moves for the crowd. Finally after they did their thing they invited BMack back in to see what he could do. Amazing stuff again and laughs from the crowd but he had improved from his performance in Salvador and the stretching had worked.